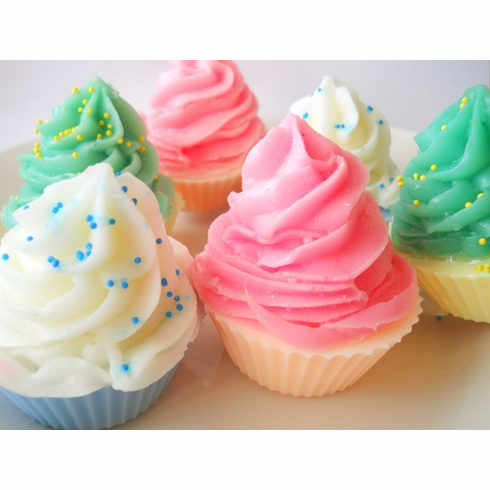 These cupcake soap party favors will be a hit at any baby shower, bridal shower, or kids party! They look so real! This set contains 15 full-sized cupcakes. Each soap weighs approximately 3.75 ounces and measures 3 X 2.5 X 2.5 inches. They each come individually packaged in a clear bag and a matching raffia ribbon and cardstock tag. Please let me know at check out what you would like on the tag. Soap may contain sprinkles as decoration. Made with 100% vegetable glycerin soap that is detergent free and vegan friendly. You can choose up to 3 different scents and 3 different color combinations. (One color combination consists of a one color for the topping and one color for bottom part of the cupcake as shown in the picture). Otherwise, I can choose 3 different scents and 3 color combinations for you. I actually have over 100 different fragrances so if you don't see something that you like in the list below, I may have it or I can probably get it.